I also hope sharply till I can find Thai people and practice it as well because when I went to Thainland last year, it was very difficult for me to communicate with Thai people. Hello Mod, how have you been…??? I really like your teaching clips and I also can practise some thai words from you. 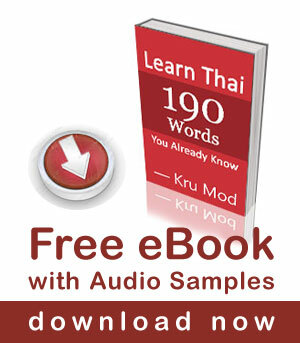 I would like to learn Thai language more from you, expecially vocabulary. But it’s difficult for me to improve it because I haven’t someone who can practise with me. Thank you for your message. I am fine, thank you.